Poetry is like chocolate. Chocolate is delicious on its own, but can also create a vivid pairing of flavor when partnered with peanut butter, pretzels, strawberries, or even a pickle. When executed well, collaboration between poetry and another medium elevates an audience’s experience of the work as a whole. However, it can be difficult to find the perfect balance between the two—perhaps even more difficult to find a collaboration that hasn’t been done to death. So when The Bones of Us, a poetry graphic novel by J. Bradley and Adam Scott Mazer, published by YesYes Books, came to my attention, I was delighted and intrigued. A poetry collection that is also a comic book!? The two halves of my geek yin and yang rejoiced! As excited as I was for the idea of the book, the question remained whether or not the two could pull it off—if Bradley’s poetry and Mazer’s illustrations could play off one another well enough to create an engaging whole, a narrative journey wherein the verbal and visual work as one. The short answer is yes. The Bones of Us tells a vivid story through both text and art from the point of view of a young man whose marriage is dissolving towards divorce. The narrative then follows this man through his grief as he tries to move on past the wreckage of his failed marriage. While not incredibly original material, The Bones of Us, thrives in its use of imagery—both poet and artist have a way with their medium that keeps things interesting. Artist Adam Scott Mazer, does a phenomenal job illustrating the poems in this collection, perfectly capturing the tone of the work with his surreal style. Mazer’s art is incredibly dreamlike—sometimes nightmarish in its imaginative peculiarity. The consciousness of the poems certainly translates well to the medium of visual narrative thanks to Mazer’s talents; his illustrations and panel layout create a disorientation that echoes the very same love-lost confusion plaguing the collection’s protagonist. By deconstructing traditional panel layout, Mazer’s keeps the reader’s eye from getting too comfortable; there is nothing predictable about how his images convey narrative. In the poem, “Knife Show,” the panels themselves transform into the final image of a bullet while the text hangs in the gutter. It took a couple times looking at this page to see exactly how its panels were the melted wedding band described in the poem; this is just one example of Mazer’s clever interpretation of Bradley’s poetry. Mazer’s work is also so rich with detail; one could spend hours studying over it. His splash pages are as curious as they are gorgeous. “Tourism,” is my favorite example of this. Here we have what I believe makes Mazer’s art truly shine—his ability to contrast realistic detail with surreal interpretation, thus creating a powerful tension. 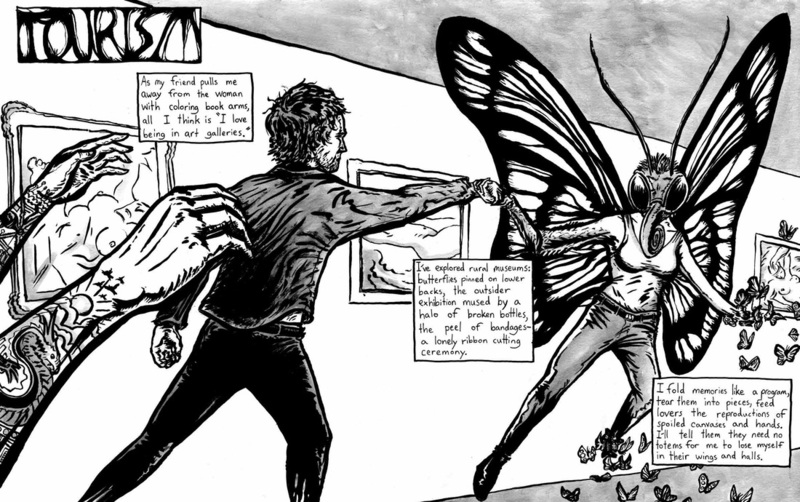 The woman pulling our protagonist toward her who is partially a butterfly, but whose limbs are also transforming into a swarm of them, is so beautiful in its bizarre. you aren’t there for the hearing. resist the urge to high-five him. Bradley certainly sees the world in a way that is all his own, and does an excellent job showing his audience how his heart and mind processes it with his use of imagery; however, this skill barely makes up for an otherwise one-dimensional narrative. I say ‘one-dimensional,’ because while Bradley is certainly expressing some things in interesting ways, he’s often not telling the reader anything new or changing up how he tells his story. The poems all seem interchangeable with one another; the tone of each is exactly the same, and I feel the only thing that differentiates one from the other are their titles. A line from one poem could arguably work just as well in another. And therein lies my only problem with The Bones of Us—Bradley’s uniform poetic narrative is completely upstaged by Mazer’s visual narrative’s unpredictability. I mention earlier how collaboration between two mediums is about balance; I believe both parts should be able to hold up on their own as strong craft, so then when paired together they should compliment, without distracting. If given only Bradley’s poems to read outside of this collaboration, I’d probably come to the conclusion that while certainly a fine one-time read, his collection doesn’t reward with multiple readings due to its straightforward approach to familiar subject material. On the other, Mazer’s art tells a complex story. His mastery of the medium and his playing with conventional page layout, along with his detailed surrealism, invites the reader to return to the same image again and again to take something new from it each time. Unfortunately the poems don’t do this for me—I don’t believe Bradley’s lines are written to allow for the reader to infer context, rather tell the reader exactly what he wants us to know. So the short answer is, yes, The Bones of Us, works as a poetry graphic novel—collaboration between text and image that provides an audience with an intriguing new paired taste. However, my long answer is that the book suffers from a small, yet clear imbalance that keeps a good marriage (no pun intended) between the two mediums here, from being great. The Bones of Us is available now from YesYes Books.